Hurtigruten Norway Coastal 6 Day Classic Voyage South. Hurtigruten's 6 day Classic Voyage South takes you from Kirkenes, near the Russian border, to Bergen, the gateway to the Fjords. This voyage is very popular among travellers who may not have time for the full round voyage, but wish to enjoy watching the transitions along the coastline as they sail from the sparse northern landscapes, deep within the Arctic Circle, to the populated, lush southern regions of the fjord-filled coast. You begin your Hurtigruten voyage in Kirkenes and embark on a five night southbound coastal voyage that calls at a total of 33 ports along the way. A unique feature of this voyage is a daytime sailing through the magnificently beautiful Lofoten Islands - for many the highlight of the region. Other highlights include crossing the Arctic Circle, visiting Hammerfest and exploring the Viking capital of Trondheim. Ports visited today : Kirkenes, Vardø, Båtsfjord, Berlevåg. On 1 October 1908 the Hurtigruten route was extended from Vadsø to a small settlement with a church (Norw. kirke) on a promontory(nes), or Kirkenes. For the 3,500 inhabitants, the main sources of income are fishing and tourism. More recently, jobs have been made available at the re-commissioned iron-ore mine. As you turn south, the northbound ports previously visited by night are now seen by day. In the afternoon the ship docks in Vardø, Norway's easternmost port. You continue along the Varanger peninsula to Båtsfjord before reaching Berlevåg in the evening. Aberdeen, Birmingham, Bristol, Cardiff, Durham Tees Valley, Edinburgh, Gatwick, Glasgow, Heathrow, Humberside, Leeds/Bradford, Liverpool, Manchester, Newcastle and Norwich. 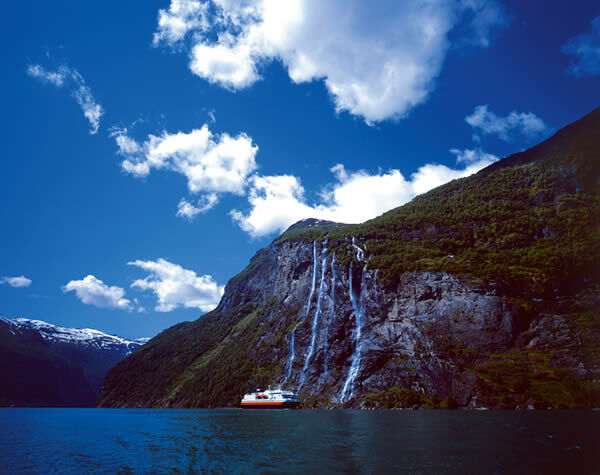 Transfer to ship Rail journey Bergen to Oslo including seat reservation. 1 night B & B in Bergen. 1 night B & B in Oslo. Transfers in Bergen and Oslo.